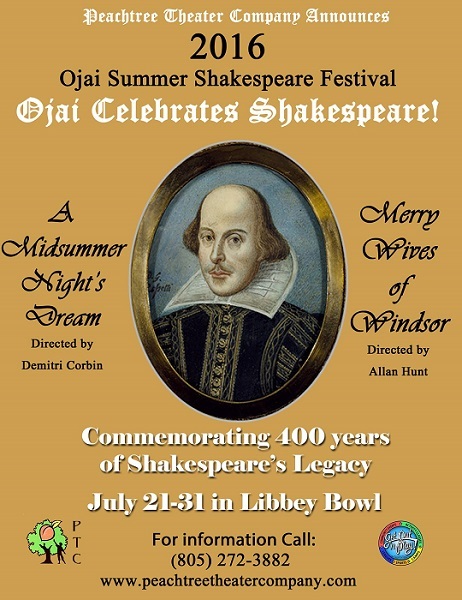 Peachtree Theater Company will present two productions during its 2016 Ojai Summer Shakespeare Festival in Libbey Bowl, July 21 – 31. Allan Hunt, from the Thousand Oaks Repertory Company, will direct Merry Wives of Windsor, produced by Peachtree’s founding director, Demitri Corbin, while Corbin directs A Midsummer Night’s Dream. Peachtree Theater Company is a not-for-profit organization that brings arts education to at-risk youth in underserved communities. Through community partnerships, Peachtree provides visual, performing, and digital media arts to school districts in the Ojai Valley. The company also pairs youth with veteran artists in full theater productions as part of its Peachtree Professional program. Past productions include, A Dragon Awaits at Ojai Arts Center Theater, The Oblong Man at Zalk Theater, and Love’s Labours Lost, a co-production with Ojai Shakespeare Festival and Ojai Arts Center Theater. With this festival season, Peachtree inaugurates its first Shakespeare internship program. Also part of the festival is a screening of Shakespeare in Love on July 21 at 7pm.